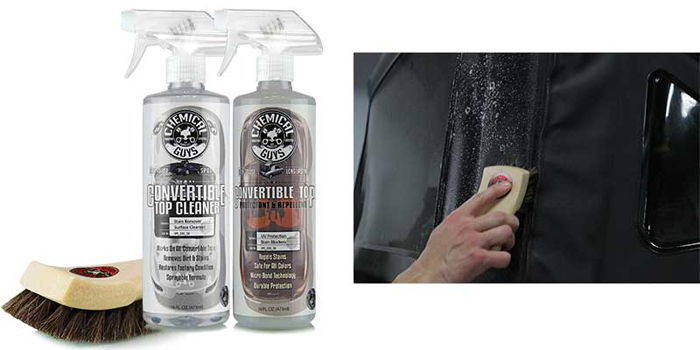 - Easily cleans any convertible soft top. - Made with natural horse hair bristles. 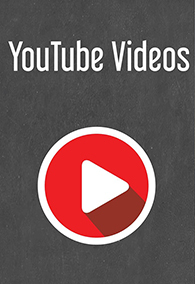 - Contoured plastic handle for years of comfortable use. - Perfect for cleaning soft tops, upholstery, shoes, furniture, and more! - Use with Chemical Guys Convertible Top Cleaner. The Convertible Top Horse Hair Cleaning Brush is the perfect tool for cleaning any convertible top. Cloth soft tops are sensitive to harsh chemicals, stiff bristle brushes, and improper cleaning techniques. The Horse Hair Brush is made with natural horse hair bristles. Horse hair is known for its softness, durability, and its gentle cleaning and scrubbing properties. The bristles are densely-packed into a durable plastic handle for years of rugged cleaning ability. The ergonomic brush handle is molded and contoured for a comfortable grip during heavy scrubbing. 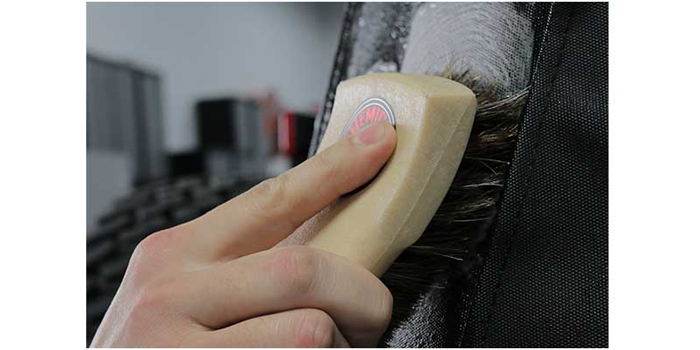 The Horse Hair Brush is tough enough to scrub away embedded dirt and tough stains, but gentle enough to use on fabric cloth tops and upholstery. 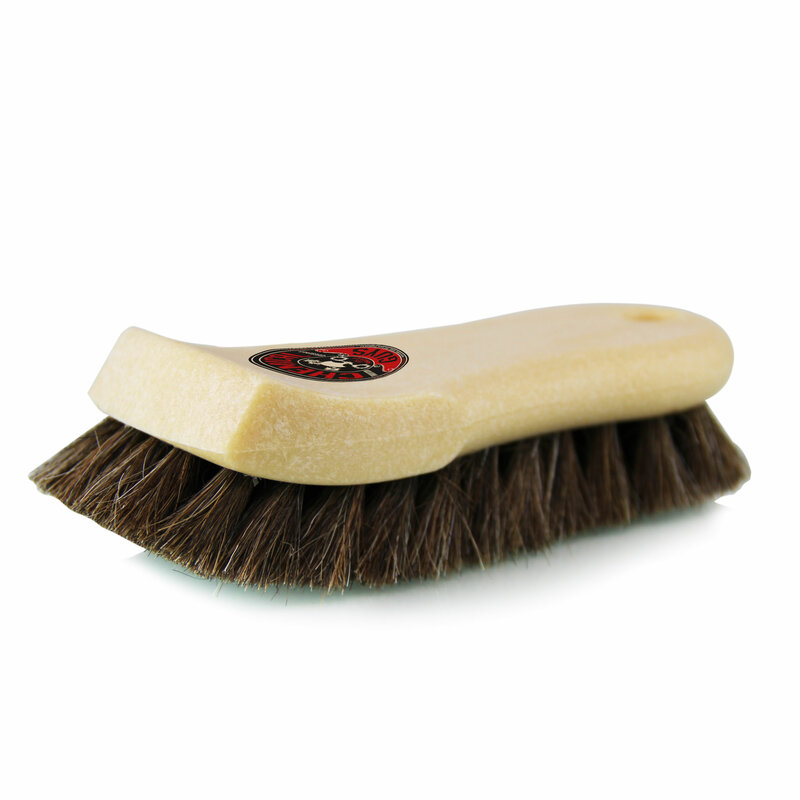 Use the Horse Hair Brush to clean dirt, bird droppings, and grime from convertible tops. The Horse Hair Brush is extremely versatile. Use the Horse Hair Brush to clean convertible tops, upholstery seats, canvas furniture, sensitive fabrics, shoes, and more. The Convertible Top Horse Hair Brush is the perfect brush for cleaning convertible soft tops. Convertible tops require special cleaning procedures and products. Use Chemical Guys Convertible Top Cleaner. to remove embedded dirt and stains without harming the sensitive fabric. Scrub cloth soft tops to agitate dirt, grease, and grime out from the fibers. 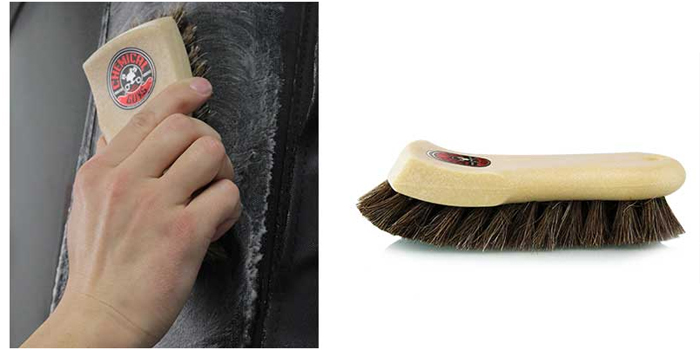 The soft and durable horse hair bristles pull filth out of vinyl and leather pores and cloth strands. Once contamination is suspended in the cleaner, simply wipe up the mess with a premium microfiber towel or rinse it away with water. The Horse Hair Brush can remove years of dirt and grime from soft tops to restore a like-new appearance. For heavy duty cleaning on even the most sensitive fabric surfaces, use the new Chemical Guys Convertible Top Horse Hair Brush. Use The Convertible Top Horse Hair Brush with premium Chemical Guys detailing products, such as Chemical Guys Convertible Top Cleaner or Lightning Fast Carpet & Upholstery Stain Extractor. Follow any convertible top cleaning with Chemical Guys Convertible Top Protectant to protect fabric surfaces against fading and discoloration from UV sunlight, and stains from liquids and dirt.